The all new 2015 Audi TT just can't seem to stay hidden before its official debut at the Geneva Motor Show this week. After a shadowy shot leaked out on Friday, more pics showed up today on Yahoo! Motoramic that reveal the new sport coupe in full. It ended up being a little more distinctive from the second-generation TT than we thought it would be, but the design here is still clearly evolution over revolution. 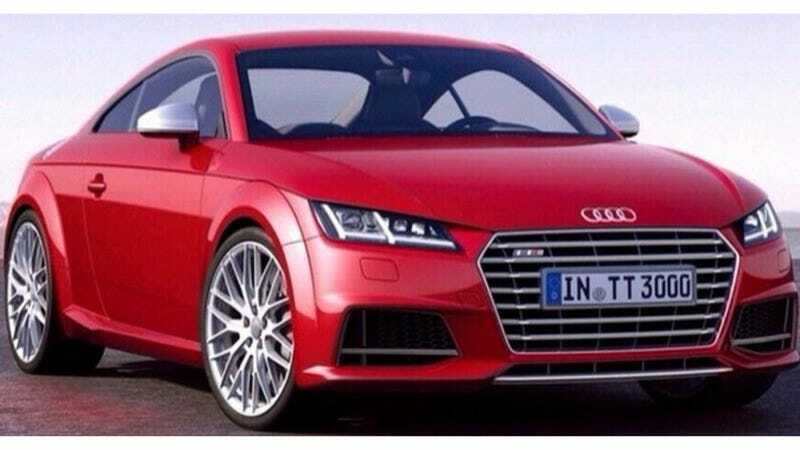 The new grille, headlamps, taillamps and shape of the C-pillar window make it stand out from the current TT. But while some may think it's a humble refresh, it's an entirely different car based on the VW Group's new MQB platform. Overall I like it, but I do think it's a bit on the boring side, and perhaps less like the future classic original Audi TT than we were led to believe. Oh well, I'm sure it will stand on its own. Perhaps the most exciting feature of the new TT is Audi's new Virtual Cockpit, which ditches the often tacked on-feeling center infotainment screen for a big display where the instruments are. It will be interesting to see more of how that works in normal driving. More photos as the Internet leaks 'em.